with Austin Desmond Fine Art, London, where purchased by Mrs Prudence Loftus, June 1991. London, Beaux Arts Gallery (not traced). Southport, Atkinson Art Gallery, The Seven and Five Society 1920-35, August-September 1979, no. 29, illustrated: this exhibition travelled to Cardiff, National Museum of Wales, September-October 1979; Colchester, The Minories, October-November 1979; London, Parkin Gallery, January-February 1980; and Penzance, Newlyn-Orion Gallery, February-March 1980. London, Austin Desmond Fine Art, Modern British Art, A Selection, 1988, no. 27. Jones executed a number of drawings of animals at London Zoo in 1928. 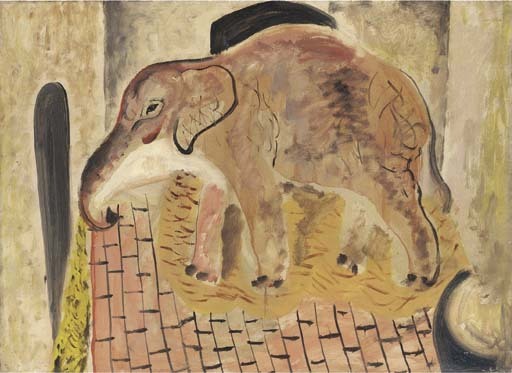 A drawing of an Elephant (private collection) was exhibited at London, Tate Gallery, David Jones, July-Septemer, 1981, no. 49. In 1928 the artist was successfully proposed by his friend Ben Nicholson for election to the Seven and Five Society, then the most progressive exhibiting group in London.